Burr elm veneers with black edging and maple scroll inlay. Satin finish. Choose between 18, 30 or 36 note clockwork wound movements. The movement is fitted to the front of the piano under a clear cover leaving a small storage area at the back. A selection of tunes for each movement size are available to choose from when ordering below. 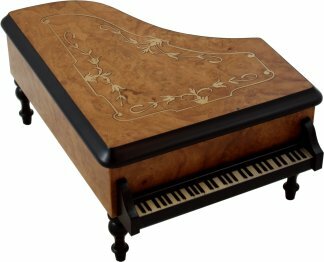 This beautiful hand crafted wood musical jewellery box is finished in burr elm with an elegant inlaid scroll marquetry set into the lid. 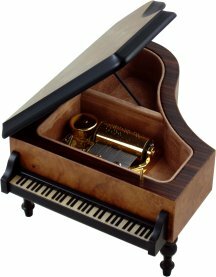 Shaped as a miniature grand piano, open to reveal the velvet lined compartment and hear the musical movement play. Choose from the 18 note or more elaborate sounding and longer playing luxury 30 & 36 note movements to be fitted. For more information on the musical movements used, please click here.